It's been while, quite a while, but I promise, I'm finally back! And I'm back for good. The past 6 months have been filled with moving... moving to Boston! I promise that I will give you guys a post on some adventures that have helped me adjust and explore the city, but I wanted my #dontcallitacomeback to start with my September Favorites! The first I wanted to mention is the Maybelline Fit Me Matte and Poreless foundation in 128, this a great medium coverage foundation that keeps me matte and helps blur pores while being super affordable ($8 USD). I love putting this on my face with the Real Techniques Miracle Complexion Sponge. I haven't tried the Beauty Blender, but with the RT sponge ($6 USD), I can't find the motivation to spend the 20$! I can apply my foundation quickly and it leaves my face looking like real skin and not as though I've applied foundation! For skincare, I've been using the Bioderma Sebium Mat Moisturing Fluid. I have combination to normal skin, so while my T zone can get oily, my cheeks and chin can be dry and flaky. The Sebium Mat Fluid keeps me hydrated but not oily - something I'm continuously thankful for! Another skincare gem, Origins Original Skin Retexturizing Mask with Rose Clay (the newer the product, the longer the name - apparently), has been on my favorites list since I got a sample at Sephora. This summer is Boston has been so humid and scorching that it's thrown my skin for a loop! At one point, I was breaking out and my skin felt bumpy, but with one of application of this mask - my skin was instantly calmed, hydrated and gently exfoliated. Top: MAC Eyeliner in Costa Riche. Bottom: Julep NailPolish in Delores. 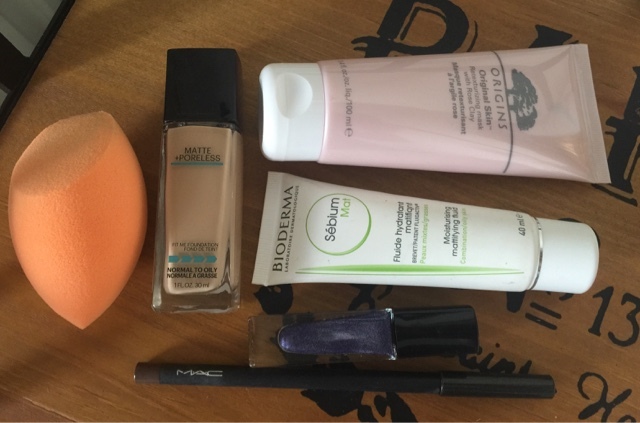 My last two favourites unexpected standout products. The first, MAC Costa Riche Eyeliner, is a beautiful warm brown and is my go to brown eyeliner when I want to create an imperfect lived-in look. It's creamy and easy to smudge - as a tip is goes beautifully with Star Violet (MAC ES)! The last is Julep's Delores, its a deep purple shade and it has a holographic finish. This doesn't look like anything special in the bottle, but on the nail it really livens up giving two shots of colour in one.